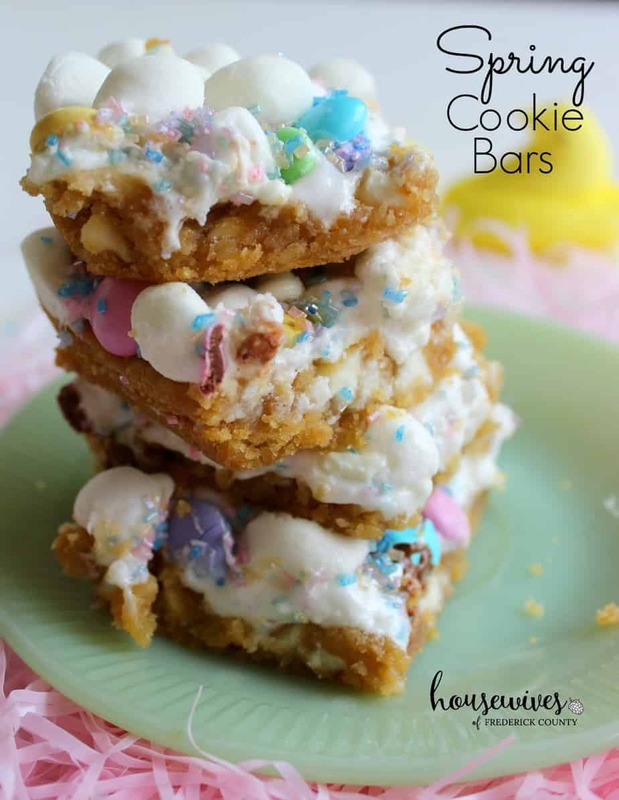 These spring cookie bars are sure to bring 100% satisfaction to any sweet tooth! Especially around Easter when sweets, in a basket, in the form of a chocolate rabbit, are very much in the forefront of the minds of little ones. There are so many things I love about Easter! First off, it represents for Christians the day that Jesus Christ rose from the dead. Being a Christian myself, that’s a big deal. 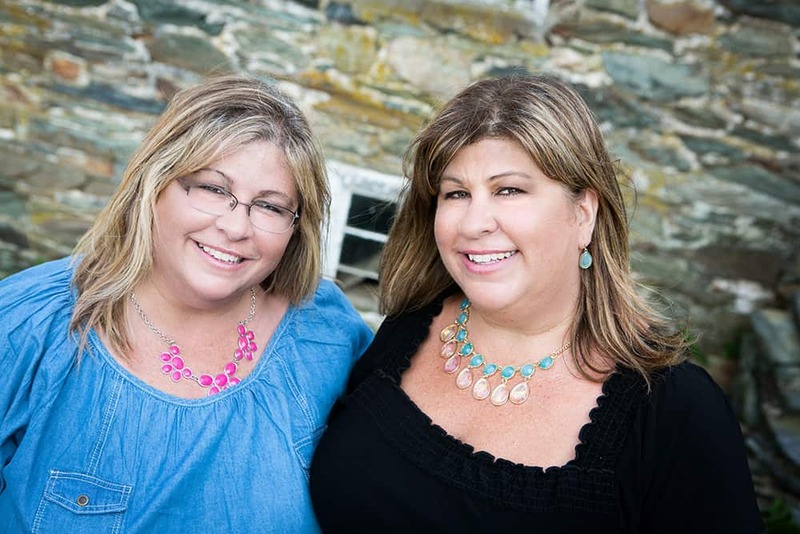 We go to church and celebrate the risen Christ. It’s a wonderful day of renewal. I also love Easter because I can see the excitement in my son’s eyes when he wakes up on Easter morning and finds all of his goodies that the Easter Bunny left for him. Then there’s the dying of Easter eggs! With all of those eggs, we make deviled eggs, egg salad, or just crack an egg open, pour a little salt and pepper over it and eat it. Lastly, there’s Easter dinner with family. I don’t typically make a dessert for Easter because I know there’s going to be jelly beans and a big chocolate bunny hanging around all day in my son’s Easter basket. But this year I really wanted to make a sweet Easter dessert. 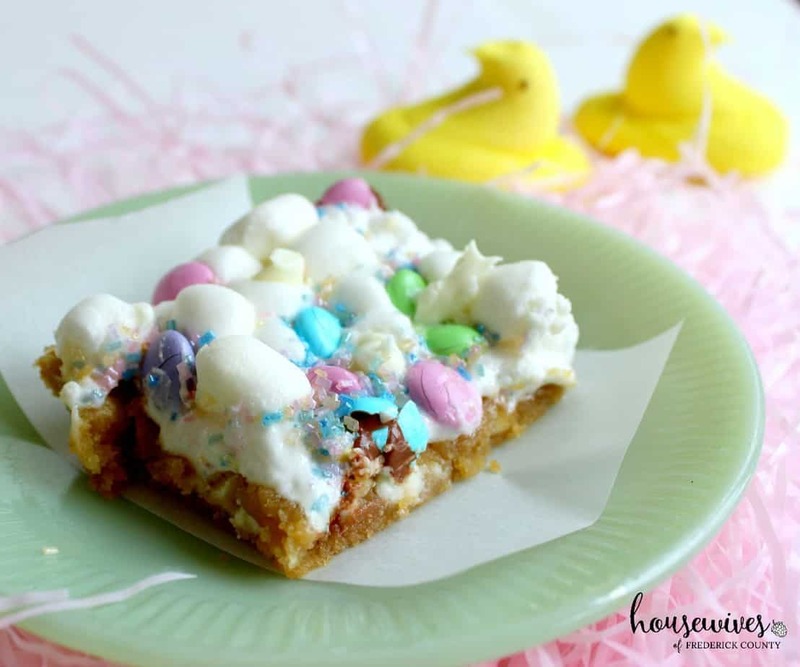 So I opted to make a batch of these spring cookie bars. 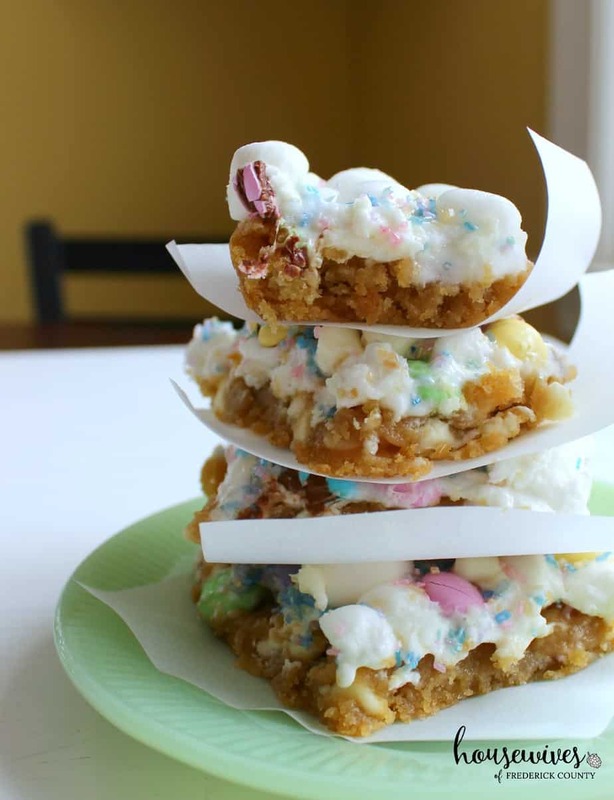 I searched Pinterest and found so many great Easter dessert ideas. 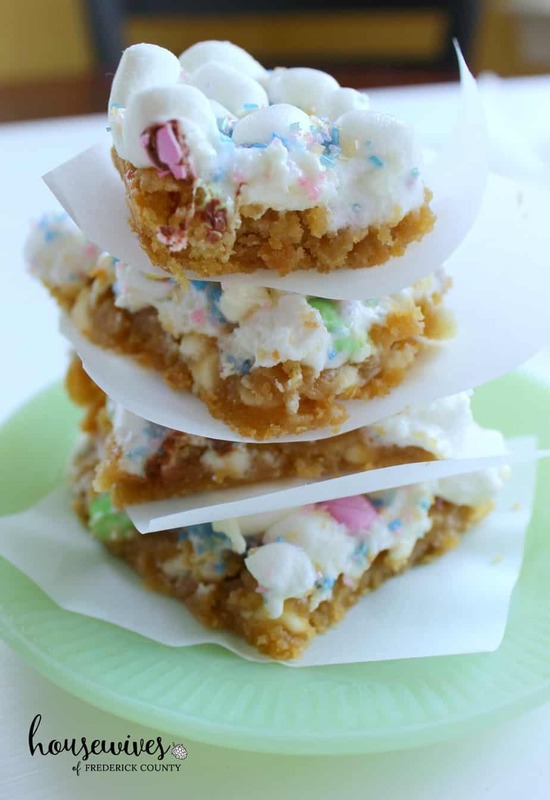 But this particular recipe for Spring Confetti Bars from Chelsea’s Messy Apron looked too good to pass up. I changed the recipe up ever so slightly to make it my own, so I changed the name to Spring Cookie Bars. These bars are seriously SWEET! I wanted to make them sort of as a trial run before Easter, so I brought them over to my sister’s house, who had friends over for the Daytona 500 NASCAR race. 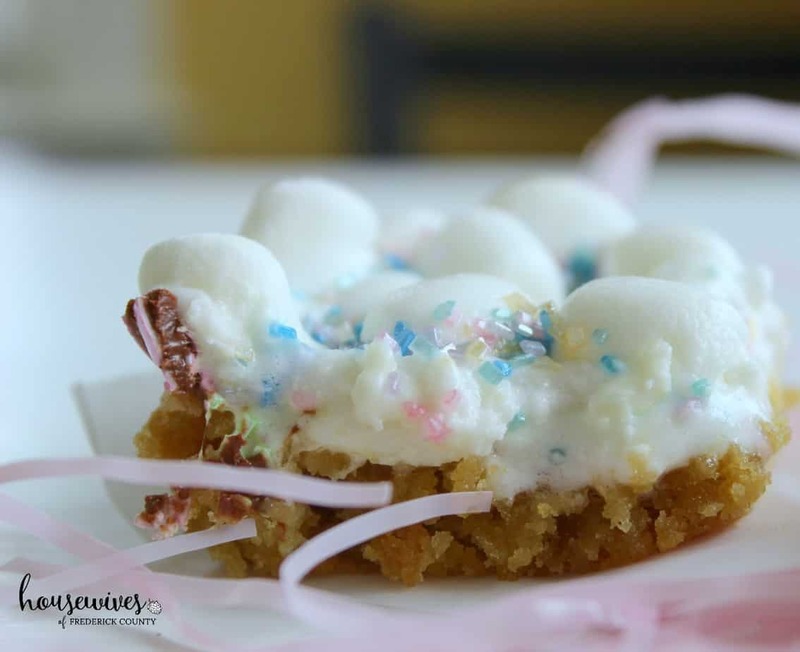 These spring cookie bars were a total hit, especially with the kids! Because of the spring colors, with the pinks and blues, you could make these for a baby shower or a gender reveal party too. 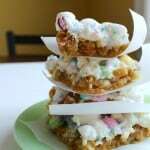 These spring cookie bars will fit in great at any spring related event. Combine butter, sugar, and brown sugar in mixing bowl and use stand mixer to blend ingredients well. Mix in the egg & vanilla. In a separate bowl, combine flour, baking soda, baking powder, cornstarch, & salt. Add dry ingredients slowly to mixing bowl and use stand mixer to blend well. Stir one cup of white chocolate chips into batter. Press batter into a non-stick sprayed 9x13 pan, using a butter knife to spread batter evenly in pan. Bake cookie dough for 13 minutes. Remove from oven and sprinkle marshmallows and M&M's on top. Return to oven for approximately 4 minutes. Remove and place onto cooling rack. Sprinkle remaining white chocolate chips and sugar sprinkles on top of the bars. WARNING: Did I mention that these bars are SUPER sweet? If you prefer something a little less sugary, I would recommend you cut the following ingredients in half: white chocolate chips, marshmallows, & Spring M&M’s. I also think using 3/4 of a stick of butter as opposed to a full stick of butter would work just fine. What tried and true dessert recipe do you like to make for Easter? My mom used to make this bunny cake every Easter. Just seeing this vintage recipe brings back such fond memories of days gone by. Yum, I’m drooling!! So Pam, when are you bringing them over????? 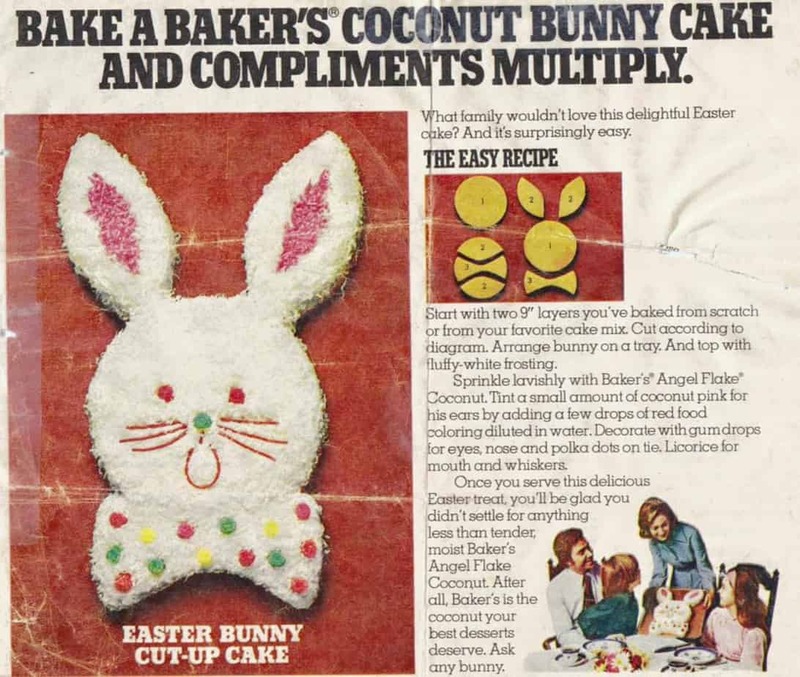 I remember that bunny cake that your mom used to make–so cute and delicious! !